Sometimes I still can’t believe I’m a grown up. The other day I called Shawn on my way home from work and we talked about what we needed to have ready for our tax meeting in a few weeks, whether he had checked our PO box to see if our renters had mailed us our rent check for the month, when we should buy our plane tickets for our Hawaii trip this summer, and whether I had emailed over the contract and invoice to a potential client for our videography business. Was it really only 10 years ago that Shawn was asking me to senior prom? And only 6 years ago that we were graduating college? And it’s already been over a year since we got married? I can’t believe how much we have already accomplished. This might be the funnest time of my life. Shawn and I are in this great “in between” time where we are finally getting our careers and passions figured out like real grown ups should, but still young at heart and plan spontaneous weekends away at Lake Tahoe for Christmas. When I was little being a grown up seemed so daunting. So many responsibilities, so many bills to pay, so many balls to be juggling at once. I thought being a kid was fun, but…dare I say it…being an adult is even more fun. Earning things on your own. Working toward dreams. Even buying myself a pack of gum when I’m filling my car up for gas just because I can. This pork chop dish is the perfect metaphor for life as a grown up. When you’re a kid you think pork chops with store bought applesauce is just about the tastiest dish you can imagine. Oh no little one. It gets better. A lot better. The grown up version are these delicious bone in pork chops, moist and full of flavor. 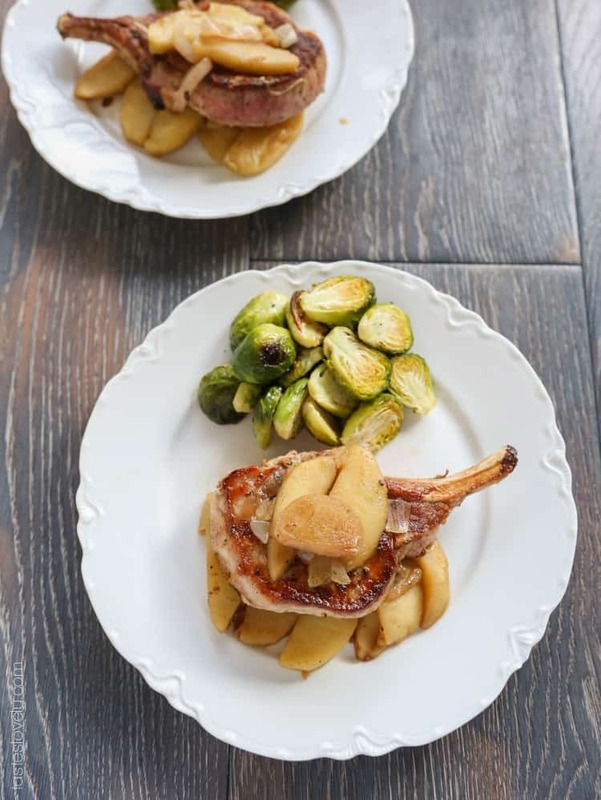 Instead of a jar of applesauce, these pork chops are topped with tart apples and savory shallots braised in white wine and flavored with vanilla bean seeds and butter. And now that you’re a grown up, of course you love those brussels sprouts that you turned your nose up at when you were a kid. Were they ever really as bad as you thought? And just like being a grown up, it’s a little more work, but in the end it is worth every minute of extra effort. 1. Preheat a cast iron or heavy bottom skillet over medium high heat. Use 2 teaspoons salt and 2 teaspoons pepper to season both sides of the room temperature pork chops. Add in 1 tablespoon olive oil and 1 tablespoon butter, and cook the pork chops about 8-10 minutes per side, until golden brown. Once cooked, remove pork chops and tent with foil on a plate. 2. With the heat still at medium high, add in the remaining 1 tablespoon olive oil and 1 tablespoon butter, the apples, shallots, and remaining teaspoon of salt and pepper. Cook about 4 minutes until the shallots turn translucent and the apples begin to turn golden brown in parts. Add in the 2 cups of white wine, vanilla bean seeds and vanilla bean stalk. Cook until the apples are tender and the wine has reduced to about 1/4 cup, about 6-8 minutes. Add in the 1 tablespoon heavy cream (optional). 3. 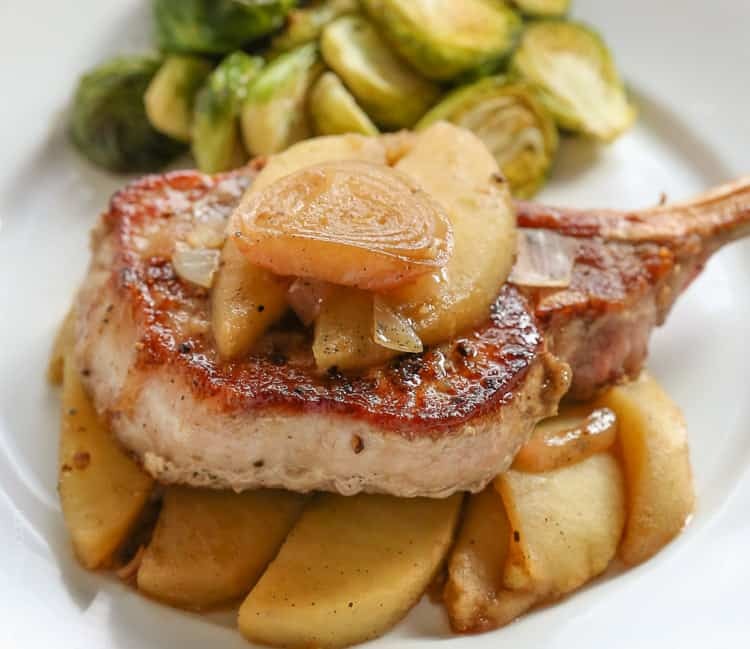 Serve the pork chops topped with the vanilla apples, shallots and pan juices while still warm. Will keep in an airtight container for 1 week. order=honor, haha! Apparently too much DayQuil for me today. What a lovely post and so well said Natalie! Who knew so many things would change, many things for the better once you became an adult:) These pork chops are definitely better than I remember the ones I ate growing up. Pinning. 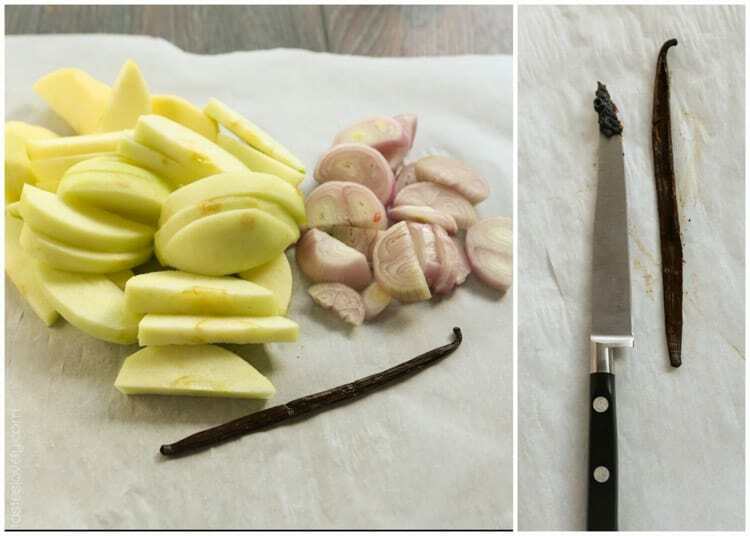 They look so tasty and flavorful with the tender cooked apples and so so mouthwatering! There are good things and bad things to being all grown up, the sad part is you can never be a kid again. The great part is the ability to do as your please. And these pork chops look and sound absolutely spectacular. Apples with vanilla bean and white wine! sounds amazing!!! Thanks Kathy! I bet as soon as you have a kid it’s like relieving childhood all over again. Definitely looking forward to that : ) You must make these pork chops for your family, I bet they will love them. 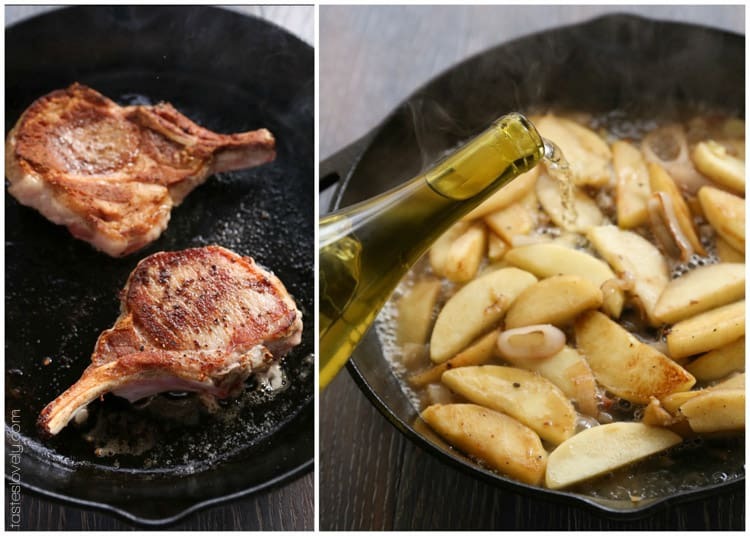 This grown-up version of pork chops and apples is the only version I want to know. I am in love with the photo of the wine bottle over the steamy pan of apples and shallots. We love pork at our house, but I find that we don’t have it as often in the rotation as beef or chicken. Not sure why. I must change that! I agree, being an adult is fun! There are times here and there (cough, cough tax season) that I find myself longing for the days of playing Barbies allllllllll afternoon, and when the only worry I had was what I would have for an after-school snack. But I love now that I’ve had enough life experience to be able to reflect on experiences, set goals, surround myself with positive people, and strive to be my best self. I guess that’s the wisdom gained in growing up! You’re so sweet Ashley! Didn’t that photo turn out good? That’s the first time I’ve done an “action” shot without Shawn’s help. I was mighty proud that the picture actually came out in focus! Ha! I don’t make pork that often either, we’re definitely a chicken family. But it’s nice to mix up once in a while. 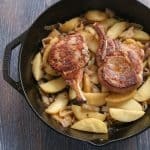 These pork chops look so so good, I love apples with pork! And the vanilla bean, that sounds really good! Thanks Kelly! We have our tax meeting in 2 weeks. Hoping we don’t owe too much, fingers crossed. Maybe we’ll even get a refund this year, *knock on wood*. We hire a tax guy to do everything for us. Helps me sleep at night knowing we’re not missing anything. Aww you guys sound like a great couple! I married my middle school sweetheart lol and things change. As we age we take many more roles and have to become responsible. One thing that never changes is the love that keeps people together!! I love this recipe but I don’t eat pork. I want to taste the apple vanilla flavor so bad so I’m going to try it with lamb chops! I bet this would be delicious with lamb chops! Or even chicken. Pork chops and apples are something that I never got as a child, but your version looks like it belongs at a 5 star restaurant. I would definitely pay a pretty penny to eat this meal. Gosh you make being a grownup sound so fun and all I think about is the bills I have. I am going to think about being a grown up in the simplest way from now on! If you’ve never had pork chops and apple sauce you’re in for a real treat Shaundara! You must make this for dinner sometime. 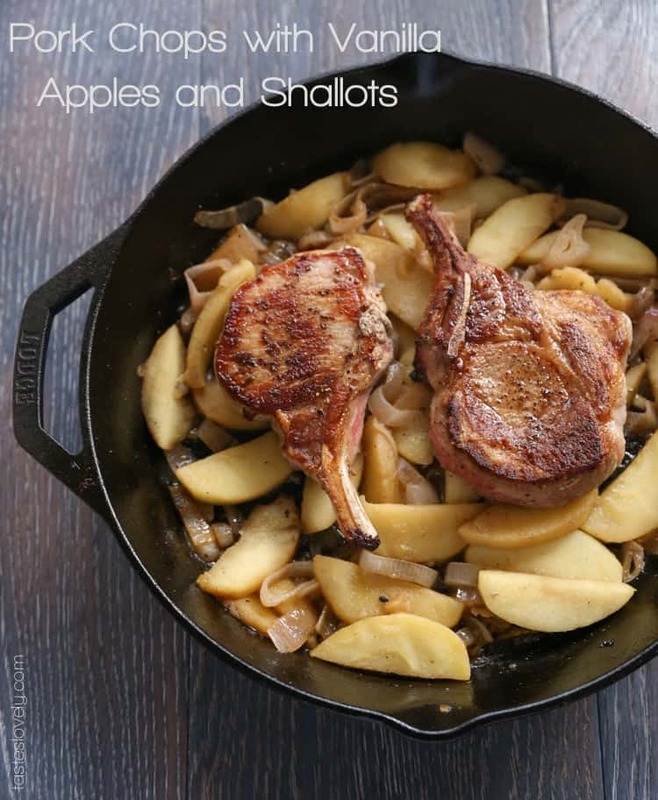 Apples and pork chops taste amazing together. I’m definitely a “glass half full” kinda gal, which helps me not freak out about things like taxes coming up, ha! Ooh, these pork chops look amazing. 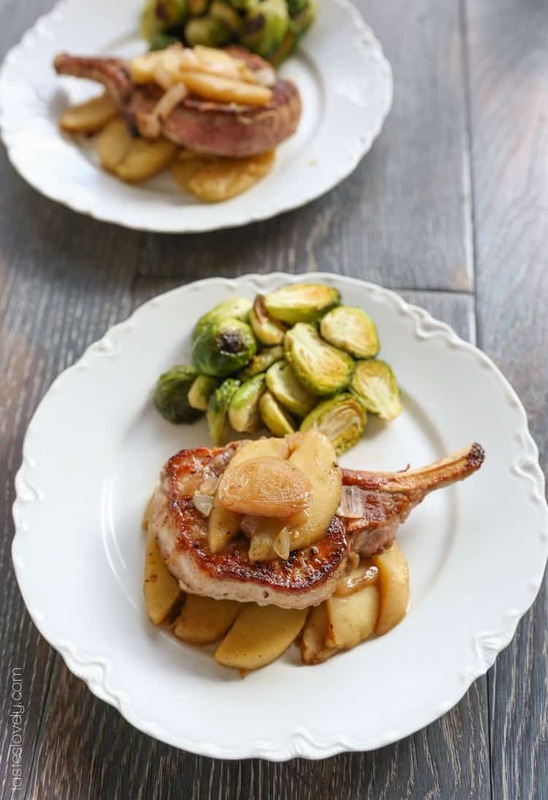 I’m always looking for new pork chops dishes and this is going to have to go into my rotation! This recipe sounds fantastic! I’m not often a huge fan of pork chops because, when prepped by yours truly, they tend to dry out too much . . . but those look moist and delicious. Yum! I agree – being a grown-up is more work but way more fun! And this dish looks ahhh-mazing. Those brussels look like the perfect side dish, too! Haha. I totally have that “when did I become an adult” convo with myself all the time. At times I definitely don’t feel like I’m an adult, but I just keep going along with it! The apples and vanilla are such great additions to this dish. I’ll have to make this for my boyfriend who loves pork! This sounds so great, Natalie! I’m a little scared of being “grown up” like you said, it’s so daunting! But if I get to eat things like this then I think it’ll be ok! Also, I would never have thought to add vanilla in there, great idea! Thanks Lou! Don’t worry, someday you’ll be writing a check to pay your mortgage and it will hit you, “Whoa, I think I’m a grown up now.” You’ll do great. And the vanilla makes this so delicious! Being a grown up certainly has its advantages, but it’s nice to goof off every once in a while. I love pork chops but they have never look as good as yours! Awwh I really enjoyed this post, Natalie! pork and apples go so well together! yum! Goood post. I learn something new and challenging onn blogs I stumbleupon on a daily basis. Making this for dinner tonight sounds delicious love pork.Many thanks.